The "belt" that doesn't look like one, the Evoflex® features unique stiffened end straps that stay where they're put and won’t twist or fall. Use on the hips or legs (mid-thigh for sports or anterior tilt chairs). Install on almost any chair style with a variety of mounting options. Barry Long explains how he uses the Evoflex®. Taking the hassle out of hip belts, the Evoflex® is the first chest or trunk support with stiffened end straps that stay right where you want them to, and won't twist or fall into the wheels. 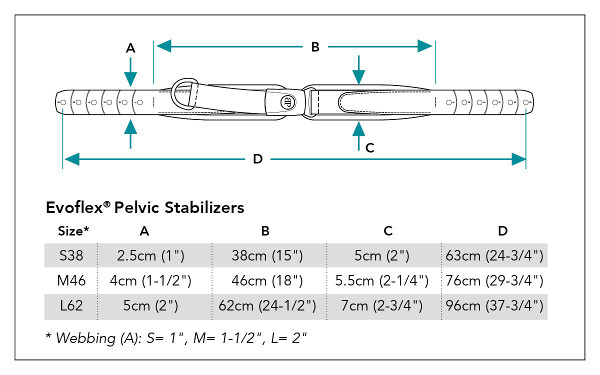 Sleeker and more convenient than a traditional belt, it gives users secure support and is ideal for on-and-off use. Around town or on the field, the Evoflex is at hand when it's needed. Note: if "D" below is shorter than the distance between possible mounting positions on the chair, a Belt Mounting Extension Kit (HKA12) will be required.